How Does Pelvic Adhesion Impact Your Fertility? Pelvic adhesions are basically scar tissue that can distort or completely block the fallopian tubes. Because of this distortion and blockage, many women end up developing sexual problems. The condition is more common in women suffering from endometriosis, especially when it is left untreated. Moreover, surgery, such as Cesarean sections can also lead to the formation of adhesions. Sometimes, your pelvic adhesions are the result of infections. Irrespective of the cause, pelvic adhesions or scar tissue can cause significant pelvic pain. It is important to understand the impact of pelvic adhesion on fertility and seek medical attention to prevent any complications. Let's find out more about it. You are likely to develop pelvic adhesions when you experience anything that causes an inflammatory response. Surgery is the most common cause of adhesions, and certain types of surgeries are more likely to cause this problem. Statistics show that more than 55% of people who undergo pelvic surgery end up developing adhesions – this is true for open and laparoscopic surgery. What it means is that you are at an increased risk of adhesions when you undergo reproductive pelvic surgery. Adhesions can be the result of myomectomy, which refers to a procedure used to remove fibroids. You may also develop adhesions when you undergo a tubal surgery, which is usually recommended to help remove an ectopic pregnancy. Similarly, surgery on the ovary to get rid of cysts and surgery for endometriosis can also increase your risk of getting pelvic adhesions. The impact of pelvic adhesion on fertility can be quite severe, and many women who develop a scar tissue often find it difficult to get pregnant again. The real problem is that you require a surgery to have a scar tissue removed, but it can lead to the formation of another scar tissue. It is hard to break this vicious cycle. While laparoscopic surgery that is performed through small incisions is less likely to cause adhesions, you may still end up getting one. Microsurgery is usually a safer option because it causes less tissue damage and lowers your risk of developing pelvic adhesions. Be sure to talk to your doctor and know about the complications associated with any surgical procedure because your decision can have a direct impact on your fertility. Endometriosis, abdominal trauma, previous surgery, infections, and appendicitis can all lead to pelvic adhesion. Adhesion can make it difficult for you to become pregnant again because of many reasons. Adhesions can affect the ovaries and fallopian tubes, which are mobile and are free to interact with each other. When you ovulate, the egg bulges outward and leads to the formation of a bulge on the surface of the ovary – the bulge is called the stigma. There are fimbriae or finger-like structures at the end of the fallopian tubes – they help capture the egg after it is released. The stigma becomes sticky after the egg is released, and the fimbriae get stuck to the area of the stigma to ensure that the egg moves directly into the fallopian tube. Adhesions can affect the whole process, making it extremely difficult for women to conceive. 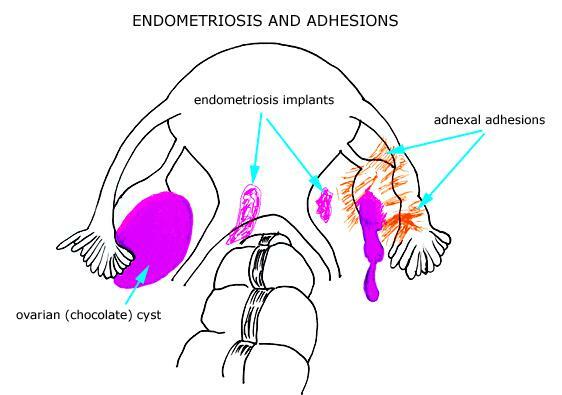 Because of adhesions, it can become difficult for the egg to land inside of the fallopian tube. In this case, an adhesion actually works as a barrier between the fallopian tube and the ovary. When the tube fails to get the egg after it is released, you just cannot get pregnant. Similarly, it is also possible for the fimbriae to fail to reach the egg if adhesions pull the ovary and tube apart. If you have pelvic adhesions, it is important to talk to your doctor and find how it affects you. In most cases, you will experience severe pain, but you may be able to get pregnant if adhesions in your pelvis do not affect the ovaries or tubes. Pregnancy may become quite painful though. It is worth mentioning that you will have to undergo surgery to diagnose pelvic adhesions, and it makes things a lot difficult. Sometimes, the tubes have normal mobility, which suggests that adhesions are not affecting them, but there may be something else 'blocking' the tubes from the inside. You may require a hysterosalpingogram to confirm if you have a blocked fallopian tube or not. As mentioned already, the impact of pelvic adhesion on fertility can be quite severe depending on where those adhesions have formed and how they affect the fallopian tubes and ovary. If there is no blockage in the fallopian tubes and adhesions are making it difficult for you to conceive, you may have to undergo surgery. The process of removing adhesions is often referred to as "lysis of adhesions" and involves cutting away adhesions. Once the adhesions are removed, the normal pelvic anatomy is usually restored, allowing you to conceive once again. However, you need to bear in mind that the surgery usually proves effective only when it is done early. Once the adhesions have spread, it becomes difficult to restore the natural anatomy of the pelvis. Moreover, in later stages, the surgery does not prove effective because the adhesions can recur. Your doctor may try to use absorbable barriers to help different structures stay in place and not get stuck together. Sometimes, different types of fluid are placed in the abdomen to keep adhesions from returning. Be sure to know all your options before you make a decision about undergoing a surgery. Can Condoms Cause Yeast Infections? Why Is Your Sperm Clear?